Splatoon 2's upcoming DLC continues to prove the squid kid franchise has, bar none, the best weapons in the genre. Behold: the Bubble Blower, a new special weapon. 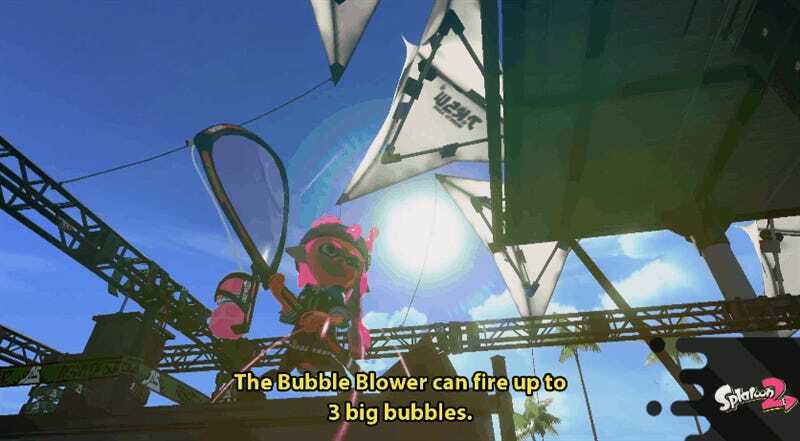 The Bubble Blower fires up to three big bubbles, which explode once doused in ink. This means you can use the bubbles both offensively and defensively—but the bubbles can also explode in your face if your enemy shoots your projectiles down. While I have no idea how good of a weapon this actually is, the mere idea is up there with paint rollers and literal buckets as weapons. You gotta love Splatoon 2's creativity. According to the lore, this place used to be inhabited but was lost due to rising sea levels. You’ll be able to take down some Salmonoid bosses in the Lost Outpost starting on August 23rd, though the stage will not appear online until an actual Salmon Run event is scheduled. Despite the trickle of smaller weapon updates over the last few weeks, I was starting to cool off on Splatoon 2, so the timing of this new stuff is perfect. I Might Be Losing It, But Splatoon 2&apos;s Salmon Run Schedule Is…Fine?